Music is the soundtrack of your business -- it is an investment that defines your brand, sets a vibe and enhances the customer experience. Cloudstream Business Music is a simple and affordable internet streaming music service that provides the best quality music on the market...bar none! 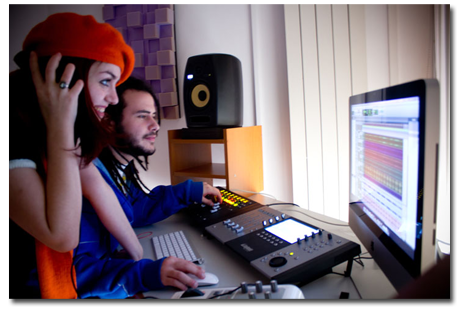 Every Cloudstream music station is professionally programed specifically for businesses like yours. Cloudstream music for business also takes care of the complicated licensing requirements required for playing music in a place of business and every one of our over 65 music channels is painstakingly cleaned of any songs that contain offensive content...all for only $29.95 per location/per month! With over 65 streaming business music stations to choose from, it's easy to find the music mix that is perfect for your business. Cloudstream’s team of professional music programmers craft each channel in every genre from an extensive library of millions of music tracks. From the most popular songs of all time, to tracks from up-and-coming and indie artists, it’s all here. Our music programmers are constantly at work updating and refreshing our station’s playlists, so our music never gets old...even if you’re listening to oldies! 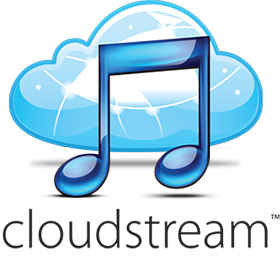 At the heart of the Cloudstream business music service is our revolutionary streaming music player. Activate your player on line, plug it into your internet connection and to your businesses’ sound system & you‘re done! 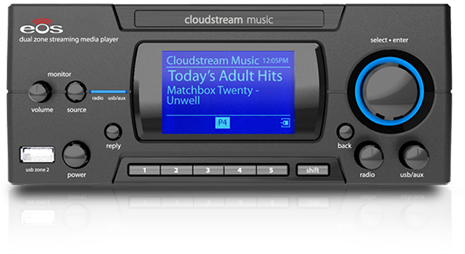 Our streaming music player is packed with features, but it’s as easy & intuitive to use as a basic car radio. Don't have a business sound system? We‘ve got you covered! Our wireless music system allows you to skip the complication, hassle and expense of hiring a professional sound installer to wire in a traditional wired sound system. 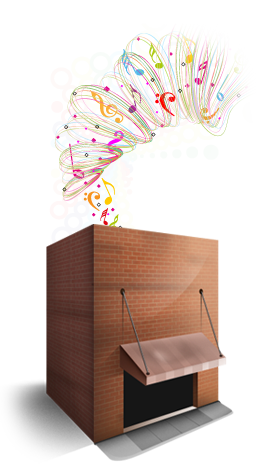 Install the wireless music system in your business by yourself in minutes, not hours! It’s the true definition of plug & play! 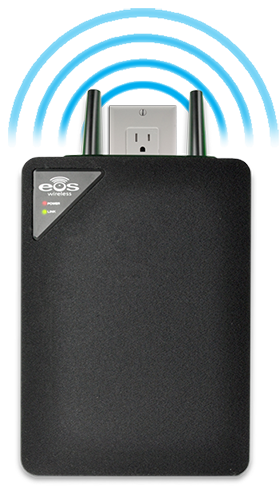 Our great sounding wireless system supports up to 12 wireless speakers which have a range of up to 300’ (100m). No static or interference, just great sound that is as good as running wires...but without the hassle. Music programed by real people – not machines! Unlike Pandora and other flavors of popular streaming music services that use computer algorithms to program their stations, Cloudstream music is programed by a real live team of seasoned music professionals who are experts in their respective music genres. Every Cloudstream station is hand crafted specifically for a business environment. Every song, on every station is designed to fit the channel and we’re constantly at work rotating in and out songs, so the playlists are always fresh. 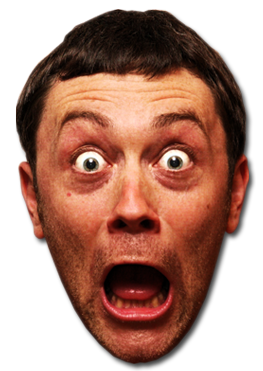 Yikes!!! The music you are playing in your business could be illegal! Without getting into a bunch of legal mumbo jumbo, if you play music in your business you need licenses from a bunch of performance rights organizations (unless you’re subscribed to a legit business music service like Cloudstream). It’s a complex mess and getting caught up in it could cost you thousands of dollars in fines and fees! It’s a fact that most businesses are unaware of...until it’s to late! When you subscribe to Cloudstream, we take care of all the music licensing madness, so you can concentrate on running your business and not running afoul of copyright laws.